Throughout Earth history, the climate has changed globally and locally and throughout nearly all time periods. Climate change has many natural causes, such as variations in the amount of solar radiation that come in to Earth's system, the position of Earth relative to Sun, the position of continents relative to the equator, and even whether the continents are together or apart. Smaller factors that are important over shorter time periods are volcanic eruptions and asteroid impacts. This chapter also discusses how natural climate oscillations caused by interactions of the atmosphere and oceans take place on time scales of decades or years. Solar radiation is so important to Earth's climate that changes in sunlight could bring about changes in climate. These changes could occur over long or short time frames. to 30% more intense than it once was. Even so, Earth was about the same temperature back then as it is today because CO2 levels were much higher. The resultant greenhouse warming made up for the smaller amount of solar radiation. The average solar radiation reaching Earth has changed only slightly during the past few hundred million years. Sunspots—magnetic storms that appear as dark, relatively cool regions on the Sun's surface—represent short-term variations in solar radiation. Sunspot activity varies on an 11-year cycle. When the number of sunspots is high, solar radiation is also relatively high. Satellite data collected over the past two sunspot cycles has shown a variation in solar radiation of only up to 0.1%, probably too little to affect Earth's climate. However, during the time between 1645 and 1715, known as the Maunder Minimum, there were few sunspots. This period correlates with a portion of the Little Ice Age (LIA), but is not necessarily the cause. The amount of solar radiation that reaches Earth's atmosphere is known as insolation. The rate of insolation is affected by the amount of clouds, dust, ash, and air pollution in the atmosphere. Rapid changes in insolation can also be caused by volcanic eruptions and asteroid impacts. Significant variations in the amount of solar radiation striking the planet can be the result of differences in Earth's position relative to the Sun. Solar radiation in a particular location can vary as much as 25%, although the global average varies much less. Nonetheless, large deviations in solar radiation have profoundly influenced global climate through Earth history by, for example, initiating ice ages. The patterns of variation are described by the Milankovitch theory, named for the Serbian geophysicist Milutin Milankovitch, who proposed the idea in the 1930s. 100,000 years: This variation is called eccentricity. When the orbit is more circular, as it is now, the amount of solar radiation the Earth receives during a year differs by only 6%. When the orbit is at its most elliptical, solar radiation varies by between 20% and 30%. Such a large variation in solar radiation profoundly affects global climate. © Earth also wobbles on its axis of rotation. This wobble is known as precession. Currently, Earth's axis of rotation points toward Polaris, the North Star. Precession moves the orientation of the axis of rotation so that in about 12,000 years it will point toward the star Vega, which will then be the new north star. At that time, the Northern Hemisphere's summer will take place when Earth is closest to the Sun (unlike now) and Northern Hemisphere winter will be when Earth is farthest from the Sun (also unlike now). As a result, winters will be much colder and summers will be much warmer than they are today. However, precession will continue, and in 27,000 years Polaris will again be the North Star. © Earth's seasons are caused by the 23.5° angle of the planet's axis of rotation. As Earth orbits the Sun, the tilt of the planet's axis relative to the Sun changes throughout the year. The Northern Hemisphere is tilted the most toward the Sun on summer solstice (June 21 or 22), when the Sun's rays reach the farthest north. The Northern Hemisphere is tilted farthest away from the Sun on winter solstice (December 21 or 22). But this axial tilt (or obliquity) is not constant. Over a period of about 41,000 years it varies between 22.1 and 24.5 degrees. The smaller the planet's tilt, the less variation there is between summer and winter in the middle and high latitudes. When winters are milder and summers are cooler in the high latitudes, glaciers are more likely to form. Milankovitch cycles. Variations in the Earth's orbit increase or decrease the amount of solar radiation the planet receives. 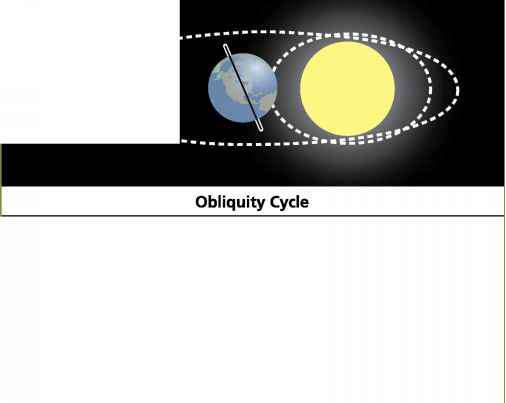 The three variations are (1) eccentricity: how elliptical the planet's orbit is; (2) obliquity: the angle of the Earth's axis of rotation; and (3) precession: the amount the Earth wobbles on its axis of rotation. glacial advances of the Pleistocene Ice Ages, has been closely associated with the 100,000-year pattern of these Milankovitch cycles. The movements of the continents and the processes that cause them are described by the theory of plate tectonics. Because plate movements determine the shapes and sizes of continents and ocean basins, plate tectonics can have a long-term effect on climate. When all the continents are joined into one supercontinent, as they were 225 million years ago (MYA), most of the land area is far from the oceans, and a harsher continental climate dominates. But when the continents are separate, as they are today, ocean currents are better able to distribute heat because more of the land surface is near an ocean. This results in less extreme global and regional climate. Plate motions also reinforce Milankovitch cycles. If continents are located near the poles, and the amount of solar radiation reaching the poles is low, snow and ice will accumulate, which is favorable to planetary cooling and perhaps the initiation of an ice age. Plate tectonics cause geologic activity that, in turn, influences climate. When limestone or other carbonate rocks push up to form mountain ranges, or when tectonic activity lowers sea level so that more carbonate rocks are exposed, these rocks undergo a weathering process that releases the greenhouse gas CO2 into the atmosphere. But if plate tectonics processes cause the sea level to rise, carbonate breakdown decreases. Plate tectonic movements cause most volcanic eruptions. These can have short- or long-term effects on the climate. The aerosols released by the 1991 eruption of Mt. Pinatubo in the Philippines reduced global insolation by 5% and decreased average global temperature by about 0.9°F (0.5°C) the following year. As a result, the United States had its third wettest and coldest summer in 77 years. During a mass extinction, 25% or more of all of Earth's species go extinct during a geologically brief period. Mass extinctions have mostly been caused by asteroid impacts, massive volcanic eruptions, or climate change. Since life began to flourish 600 million years ago, there here have been at least five major mass extinction events and many smaller ones. Many scientists agree that the mass extinction that occurred at the end of the Cretaceous Period 65 MYA was brought on by a strike from an asteroid 6 miles (10 km) wide. By the end of this period, two-thirds of Earth's species, including the dinosaurs, were gone. The story scientists have pieced together is frightening. The asteroid struck water, causing giant tsunamis that flooded coastal regions, even thousands of miles away. Dust and gas flew skyward and then coalesced into balls that fell back to earth as fireballs. This released so much energy that the atmosphere was as hot as a kitchen oven on broil. Animals roasted and forests burned. Shortly afterward, dust and smoke blocked out sunlight and the planet froze. The darkness triggered a major decline in photosynthesis, causing the plants and animals that survived the initial impact to starve. Gases that were released into the atmosphere from the limestone rock that the asteroid hit formed acid rain, which dis solved phytoplankton shells and caused the oceans' food webs to collapse. (A food web is the com plex set of food interactions between organisms in an ecosystem. An ecosystem is composed of the plants and animals of a region and the resources they need to live.) Carbon from the limestone mixed with oxygen in the atmosphere to form CO2, which brought about years of intense greenhouse warming. Scientists think that other mass extinction events may also have been caused by asteroid impacts, including the extinction that took place 250 million years ago, at the end of the Permian Period, during which 95% of Earth's species perished. basalt eruption or an asteroid impact—or by a combination of the two is a matter of much debate among scientists. Even without asteroid impacts and volcanic eruptions, climate change can cause mass extinctions. Planetary cool ing resulting in an immense glaciation is thought to have caused the extinction of nearly 80% of the planet's species 544 million years ago. Climate change is at least partially responsible for the extinctions of large animals that came at the end of the ice ages 10,000 years ago. dust, and aerosols into the stratosphere, block sunlight, and cause global cooling. Conversely, the eruptions release CO2, which causes greenhouse warming. If the basalt eruption is rich in sulfur gases, the sulfur combines with water vapor to produce sulfuric acid haze. Sulfur-- and nitrogen--oxide gases in the atmosphere combine with water vapor to form sulfuric and nitric acids, which later fall as acid rain, rain that is more acidic than natural rainwater. Acid rain can damage plants and dissolve shells and have many other negative effects. Similarly, asteroid impacts can cause climate change as enormous amounts of particles are thrust into the air and block sunlight, leading to global cooling. On the other hand, sulfur gases, CO2, and water vapor are greenhouse gases that cause global warming. Mass extinctions are possible results of asteroid impacts or flood basalt eruptions. Natural climate variations take place on time scales of years or decades and are caused by shifts in atmospheric and oceanic conditions. These shifts are due, at least partially, to the way the oceans store and trans-port heat. An example of a natural climate variation is the El Nino-Southern Oscillation (ENSO). ENSO oscillations have a cycle of about 3 to 8 years and are directly related to the interactions between the ocean and atmosphere. ENSO is the foremost source of multiyear variability in weather and climate around the world. ENSO impacts the South Pacific gyre. In a normal year, the cold Peru Current travels northward up South America. The cold, dense current allows nutrient--rich deep ocean water to rise to the surface, causing plants and animals to thrive. This current travels north to the equator, where the trade winds then push it westward. The equatorial Sun warms the current as it goes. After reaching the western Pacific, most of the water moves north, south, or even back across the equato--rial region as a subsurface countercurrent. But some of the water piles up in the western Pacific and continues to warm. The trade winds move from east to west across the equator because the cold water in the east--ern equatorial Pacific cools the air above it and creates a low--pressure cell, and the warm water in the western Pacific warms the air above it and creates a high--pressure cell. In time, the high and low atmospheric pressure cells weaken, caus--ing the trade winds to weaken or reverse direction. These reversed trade winds drag warm water rapidly from west to east, enhancing the countercurrent. When the warm water hits South America, it spreads over the cooler, denser water and shuts off the rising of the deep, nutrient-rich water from below. This begins an El Niño, named for the Christ child by Spanish fishermen because the phenomenon often begins around Christmas. Without nutrient-rich water reaching the surface, the marine food web suffers. An El Niño event ends when most of the warm western Pacific waters have moved east, about one to two years after it begins. When the event is over, normal circulation patterns resume in both the atmosphere and ocean. The oscillation between atmospheric high- and low-pressure cells in the western and eastern Pacific is termed the Southern Oscillation. Sometimes, after the El Niño ends, the air and water move to the west more vigorously than normal, and unusually cold water accumulates in the eastern Pacific. This pattern is called La Niña. The North Atlantic Oscillation (NAO) is much weaker than an ENSO, although the patterns are similar. This climate pattern mostly affects Europe. The NAO oscillates between a low--pressure cell over Iceland and a high--pressure cell over the mid--Atlantic Azores Islands. At high NAO, storm tracks are shifted northward into northwestern Europe so that northern Europe is warm and wet, and Mediterranean Europe is dry. At low NAO, storm tracks are shifted southward into the Mediterranean region. Over the past 30 years, the NAO has become more intense, perhaps due to global temperature increases or natural variability. Pacific climate oscillations also include the Pacific Decadal Oscil--lation (PDO), with has a 23-year pattern, and the Interdecadal Pacific Oscillation (IPO), which has a 15- to 30- year cycle. Oscillations in the Atlantic include the Atlantic Multidecadal Oscillation (AMO). Natural processes alter Earth's climate on various time scales. Climate can be altered by singular events, such as volcanic eruptions and asteroid impacts. Climate can be altered by short-lived variations in atmosphere-ocean interactions, such as ENSO and NAO, that act on cycles of several years. Milankovitch cycles, which involve the relationship between the Earth's wobble, its tilt, and orbital position relative to the Sun, take place over tens of thousands of years. Large or rapid changes in climate can cause the extinction of species, sometimes even on a mass scale. After a mass extinction, the Earth's ecosystems are very different from the way they were before.